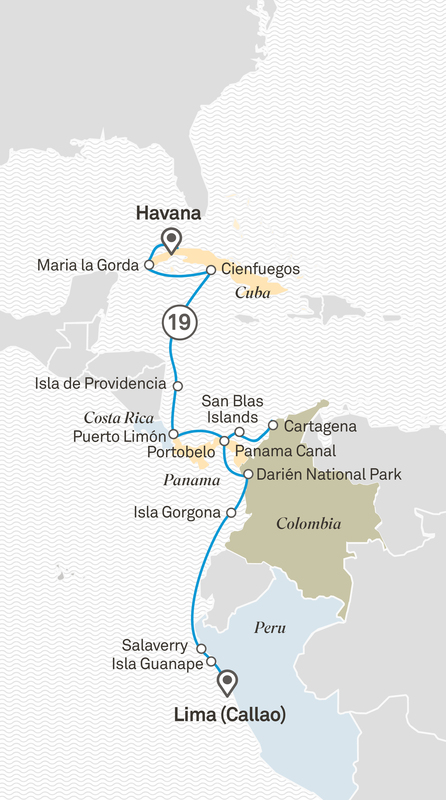 From the heady passion of Cuba to the biodiversity and magnificence of the Central American jungles, from wildlife rich islands off the coast of Colombia, Panama and Peru to pre-Colombian ruins, this discovery cruise is a feast for the senses. You’ll love discovering the hidden gems of Cuba then spending endless, balmy days exploring pristine Caribbean islands and cays containing some of the most exquisite snorkelling sites in the world before traversing the man-made wonder that is the Panama Canal. The islands teeming with bird and marine life are waiting to be explored as are the well-preserved pre-Colombian ruins on the north coast of Peru. Step back in time and welcome to Havana where your journey into wonder begins with a warm greeting by the crew as you step on board Scenic Eclipse. Raise your glass this evening as you are entertained by a performance of Cuban music and dance. The overnight stay allows time at leisure for you to explore by day and by night. Please book your flight to arrive prior to 1pm. Havana is a fascinating city with a faded façade that is the perfect start to your cruise. Take a walking tour of Old Havana, follow in the footsteps of Hemingway or visit the house of the artist Fuster. Alternatively, learn about the Cuban staples of rum and cigars or take a ride in a 1950’s vintage car on a panoramic tour of the city. Take a Scenic Discovery bicycle tour. Today visit the World Heritage-listed biosphere reserve of Península de Guanahacabibes and the stunning beaches of Maria La Gorda. Take a walking tour of the national park or take a bird watching tour. Alternatively explore the nearby pristine Cabo Saint Antonio National Park. Take a Scenic Discovery excursion hiking in the national park or a kayak excursion along the coastline. Founded by French emigrees, Cienfuegos is known as the ‘pearl of the south’. This evening at the historical Teatro Tomás Terry witness a moving gospel choir performance. With an overnight stay you will have plenty of time to experience the charms of this small city and discover the local music scene. Visit a local artist’s studio and witness some entertaining street performers. Take a walking tour of the historic centre or discover Jardín Botánico. Alternatively, visit Playa Girón and the museum for the Bay of Pigs skirmish. Take a Scenic Discovery bicycle tour of the city. Relax on board or take a class in Scenic Epicure. Take a tour of the island. Take a Scenic Discovery hiking excursion to the top of Morgan’s Head, snorkel nearby Crab Cay and its pristine waters or snorkel the coastline and secluded bays of the island. Explore the Veragua Rainforest or visit the Jaguar Rescue Centre and the Sloth Sanctuary. Alternatively, take a highlights tour including the Tortuguero Canals or visit a banana and coffee plantation. Portobelo on the coast of Panama was an important port during the time of the Spanish conquistadors. Travel on the Trans Isthmus Railway to visit the Museum of the Canal or explore the World Heritage-listed ruins of Fort San Lorenzo. Alternatively tour the World Heritage-listed Casco Viejo historic centre. Spend the day relaxing in this archipelago, home to the Guna people and surrounded by crystal clear water and coral reefs swarming with marine life, pristine sandy beaches and coconut palms. Scenic Discovery excursions are available from snorkelling, paddling by kayak to relaxing on a beach with a chef-prepared picnic. Take a walking tour of the colonial centre, or discover Mercado Bazurto and join a cooking class. Alternatively enjoy a rum and chocolate tasting experience. Lima signals the end of your cruise as you disembark after breakfast taking away memories of your adventures. Please book your flight to depart after 12pm.